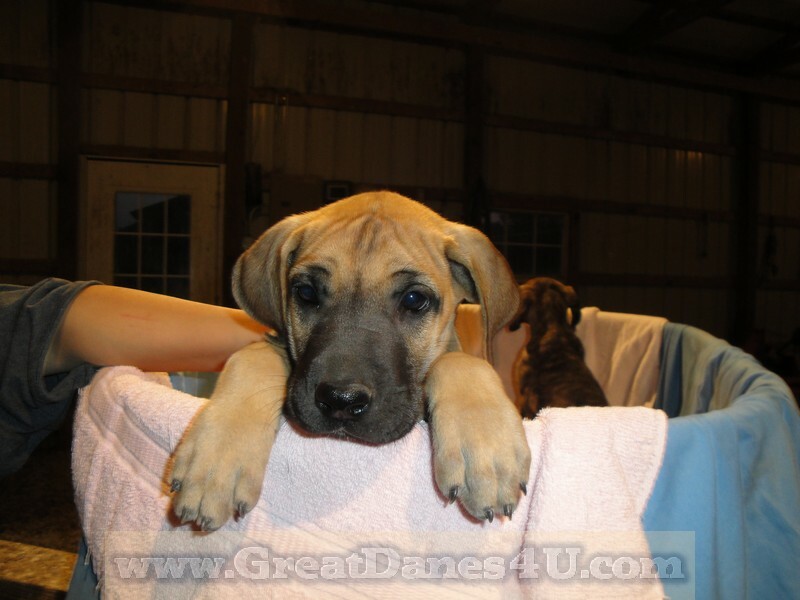 At Great Danes4U, (a Great Dane Puppy Breeder in the Springfield, Missouri - Marshfield, Missouri 65706 has Quality Great Dane Puppies for Sale. Your Great Dane puppy could be a Fawn Great Dane puppy or a Brindle Great Dane puppy or a Black Great Dane puppy. 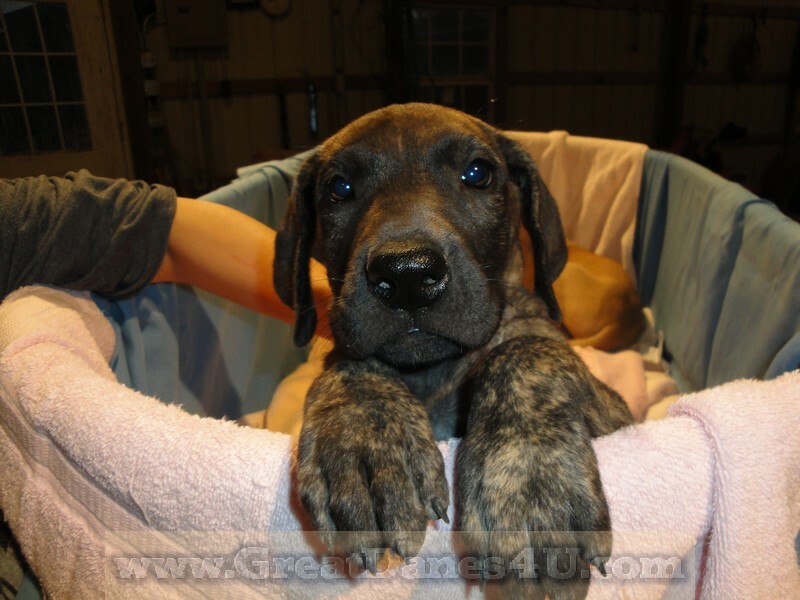 Most of our Fawn & Brindle Great Dane stock is +5-Generation Color-Pure AKC Registered. All are Micro chipped plus all are DNA Profiled. Most of our stock are OFA Certified, (Orthopedic Foundation for Animals), if age appropriate. AKC Great Dane Puppies go micro-chipped, 2 applications of Bordettela vaccine to prevent Kennel Cough, 2 Parvo shots, (or more), at least 1 Vet check, plus a variety of wormers. Most go home close to Housebroke! Enjoy Free Information about Great Danes Appearance, Standards, K-9 Care, this Breeder's Policies, Dane History and many Pictures of Great Danes on this FREE Website. Please send your comments, suggestions, or to be registered in the litter email flier database; send you email request to: Sales@GreatDanes4U.com or call: 417-859-0844 to schedule a *LIVE* Web Cam appointment or information! Please call to make an appointment to visit GreatDanes4U in Marshfield, Missouri 65706! GreatDanes4U uses this site to promote Healthy, Trained, Socialized Multi-Generation Color-Pure FAWN and BRINDLE AKC Great Dane Puppies. Many Great Dane puppies are Breeding Quality and Show Potential pups are available as well. While occasionally Black and rarely Blue Great Dane puppies are also available. Stud service also available. Air shipping includes Crate & crate prep, Vet visit, Health Certificate, Air Fare, (based on size of crate & weight + puppy weight & logistics to make it happen: *Pups under 35# add $500, Between 35 & 75#'s add $600. Shipping to the lower 48-States from the Springfield, Missouri Airport, (SGF), using American and Delta Airlines. 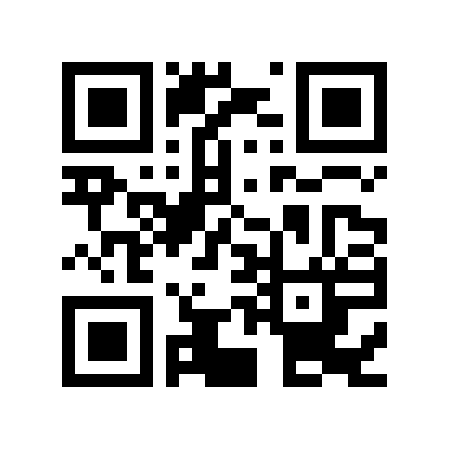 Text link Site Map in footer to Navigate this extensive website. I, Roger White, phone 417-859-0844, located at 938 Whispering Oaks Road in Marshfield, Missouri 65706 with email of Sales@GreatDanes4U.com hereby offer the Stud: Le Tigre Blanc 2-C-4-UR-Eyes Only with AKC number WS48785202, AKC Microchip #: 00753B568 for breeding service. Le Tigre' has an AKC registered DNA profile number: V765807 . 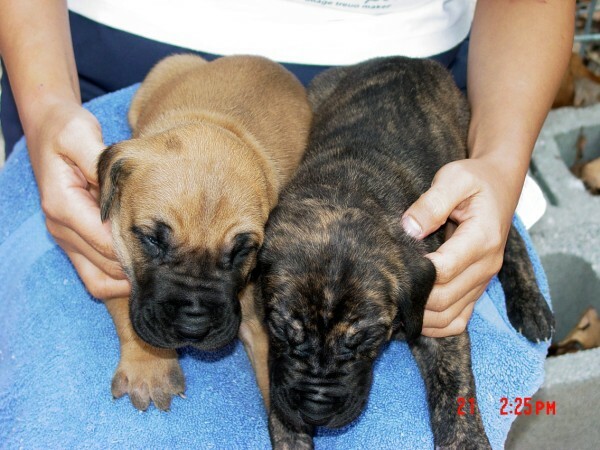 Le Tigre' is a AKC Brindled colored male with +6-generation color purity pedigree. Le Tigre' Blanc's is dual registered also with the APRI Registration #: A15-ZA-BC-33989T. Le Tigre Blanc's Rabies Ser. #: S407982 Tag #: 27015 16 Mar 2015 Le Tigre' has been Examined by Ellen Ratcliff DVM of Fair Grove Veterinary Service and provided his rabies shot on Ser. #: S407982 Tag #: 27015 16 Mar 2015. Tiger is currently up to date with numerous Parvovirus shots and successive rounds of SMZ-TMP and Panacure worming treatments. Le Tigre' is on Heartworm medication and has been tested for Brucellosis as well. **Le Tigre' has not been OFA tested for anything as of Jan 2018. Le Tigre Blanc's Sire: Walden's Fully Loaded Magnum AKC #: WS33623801 10-14 APRI: A15-ZA-BC-33985T. Le Tigre Blanc's Dam: Walden's Queen Aeris AKC #: WS37963301 07-13 APRI: A15-AZ-BC-33986T. AKC ________________ colored female named ____________________________ with AKC number __________________for breeding purposes. ____________________ is to provide transportation for his/her Dam to Marshfield, MO. and back home. The dam is expected to receive reasonable accommodations for the breeding period of time not to exceed 1 week. If any special requirements are needed then _______________________ is to provide for those needs. Payment for service is to be $1,000.00 cash at time of 1st day of service or delivery of female for breeding. Should the breeding be unsuccessful then the female’s owner will have a FREE breeding during the next (choice of) 2 heat cycles and will owe nothing further for that breeding. Should the breeding result in 4 or less live puppies at birth, the female’s owner will receive ½ off the next stud fee at the next (choice of) 2 heat cycles. *Owner of the female will be expected to have their female examined by a Vet of their choice at their expense to be safe and healthy enough to breed. *Owner will also be responsible to bring such certification with them along with a negative Brucellosis test results. *Both animals should be up to date with shots and worm free. 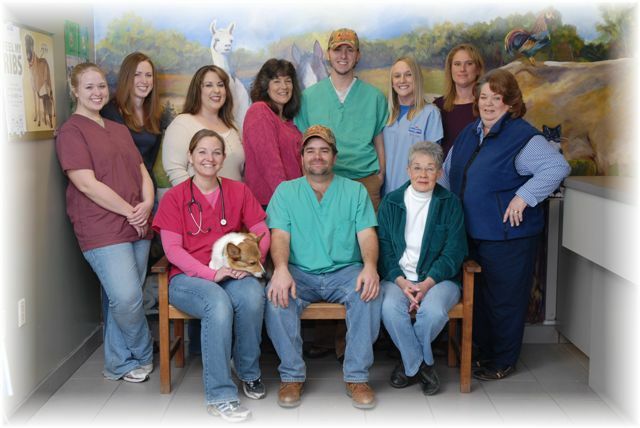 Fair Grove Veterinary Service provides you with a full library of pet medical information from the Veterinary Information Network. VIN is the world's first and largest online veterinary community, where new articles are added weekly by the experts at VIN to make sure that our readers have the most current veterinary information available. 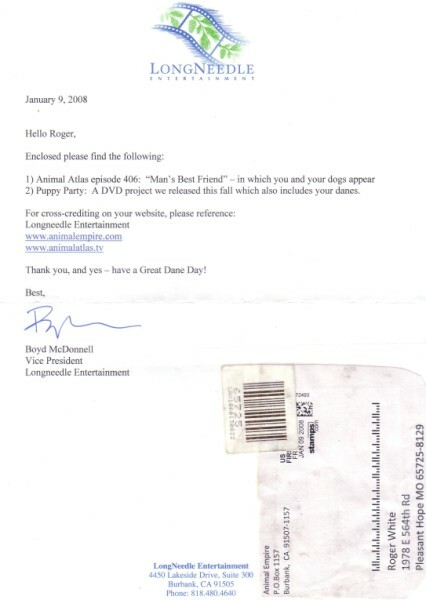 1) "Animal Empire's"; 2) "Puppy Party" both from "Long Needle Entertainment". The Fawn & Brindle Great Danes & Brindle pups are mine & yes I am in this video! 2:03 Nabilia, 3:33 Tiger, 3:58 Tiger & Lumpy, 5:53 Tiger & Lumpy, 6:17 Nabilia, 6:50 ME with Tiger, Lumpy & Black-Noser, 8:35,9:11, 17:53 Nabilia's Brindle Pups, 19:57 ME with Lumpy & Black-Noser. Want to see photos of past "Danes in the Park Days"? Copyright ® 1999-2018 www.GreatDanes4U.com All Rights reserved.